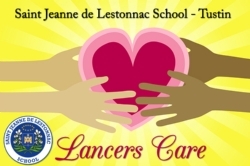 Lancers Care is an essential part of the Religion curriculum at Saint Jeanne de Lestonnac School designed to encourage our students to not only put their faith first, but to put it into action. Each grade, K-8, has an area of concentration or “service theme” which is age-appropriate and unchanging. The main component of the service theme is the adoption of a specific charity. Each year the class will either take a field trip to their charity for a day of service and fellowship or have a major service project on campus. There will also be opportunities throughout the year to incorporate guest speakers, videos, books as well as written and handcraft projects to further enrich and serve the grade’s mission. The goals of the program are to follow the example of Jesus in serving others, to teach compassion for those who are struggling in our community, our country and our world and to live out one aspect of Saint Jeanne de Lestonnac’s educational project to “extend our hands to those in need”. The focus is on inspiring our students to think outside of themselves by giving their time and talent to help others and know they can make a difference in the lives of so many, outside of monetary donations. This adds an important component to religious education in igniting the desire in our children to give to others, to be of service, to empathize with and understand those who are different and to love our neighbors in their time of need. As they transition through their years at Saint Jeanne, these invaluable experiences will be imbedded in their character to carry with them through their lives as Christian leaders of the 21st century.